This name comes from the fact that the via decumana or decimana (the tenth) separated the Tenth Cohort from the Ninth in the legionary encampment, in the same way as the via quintana separated the Fifth Cohort from the Sixth. In the middle, or groma, the Decumanus Maximus crosses the perpendicular Cardo Maximus, the primary north-south road that was the usual main street. The Forum is normally located close to this intersection of the Decumanus Maximus and the Cardo Maximus. In the ancient Roman city of Barcino (present day Barcelona, Spain), the Decumanus Maximus started at the Roman gate in front of the current Plaça Nova square, which is the only Roman gate extant. Within the city of Split in present-day Croatia is the UNESCO Roman monument, Diocletian's Palace. This city, built by the Emperor Diocletian, exhibits the characteristic Roman orthogonal street system with the Decumanus Maximus connecting the west Iron Gate to the east Silver Gate. At the present-day city of Umm Qais, Jordan, the Decumanus runs east-west for approximately one kilometre with its ancient flagstones extant; the Roman name of this city was Gadara. Another fine example is the "Straight Street", Via Recta, in Damascus, which is 1,500 metres long, connecting the eastern and western gates. In Beirut's Central Business District, Rue Weygand, which runs east-west, still follows the ancient Roman Decumanus. In Florence, the Decumanus is preserved as the streets Via Strozzi, Via Speziali, and Via del Corso in the city's old centre. Although these streets have different names they form a continuous line with a split between the Via Strozzi and Via Speziali by the Palazzo Strozzi. Roman times, these three streets formed the Decumanus of Florentina, the name of the Roman colonia. The Via Roma and the Via Calimala are formed from the ancient Cardo, and what was once the Forum in ancient Florence is now the Piazza della Repubblica. ^ John E. Stambaugh (1 May 1988). The Ancient Roman City. JHU Press. pp. 283–. ISBN 978-0-8018-3692-3. ^ Christoph F. Konrad (2004). Augusto Augurio: Rerum Humanarum Et Divinarum Commentationes in Honorem Jerzy Linderski. Franz Steiner Verlag. pp. 126–. ISBN 978-3-515-08578-6. ^ Alan Kaiser (14 October 2011). Roman Urban Street Networks: Streets and the Organization of Space in Four Cities. Taylor & Francis. pp. 160–. ISBN 978-1-136-76006-8. 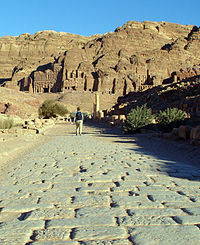 ^ "Decumanus Colonnade Street Petra". Madain Project. Retrieved 15 August 2018. ^ Fondazione GB Vico Archived 2014-03-11 at the Wayback Machine, entry on Decumani.